Fire Falling is the second book in the Air Awakens series. The review below may contain spoilers for book one of the Air Awakens series, but you can read a spoiler-free review of Air Awakens here. Fire Falling picks up right where Air Awakens leaves off with Vhalla sentenced to march in the war. Right away Prince Aldrik vows to protect Vhalla while on the march. Vhalla’s two closest friends in the Tower, Larel and Fritz, both sign up for the march in order to protect and support Vhalla as well. In Air Awakens, I was a little annoyed by a couple of the minor characters. However, I ended up really enjoying the new minor characters in Fire Falling. Vhalla meets Baldair’s Golden Guard and I loved the addition of these characters. Vhalla especially grows close to Daniel and Craig, and I hope we will get to learn more about the rest of the Golden Guard in the next book. Vhalla’s friendship with Larel and Fritz was one of my favorite aspects of the book. They’re such good, supportive friends to Vhalla, which is exactly what she needs after Air Awakens‘ ending. Aldrik is still a huge part in Fire Falling. Once on the march, Aldrik starts training Vhalla by day and studying their Bond by night. After a Joining, Vhalla is able to easier access her magic and basically inherits Aldrin’s fighting skills. Through all of this, Vhalla and Aldrik become even closer. I loved watching their relationship progress and deepen. We see a new side of Aldrik, which I enjoyed uncovering. The world grows greatly in this sequel. Since Vhalla is traveling away from the capital and into the North, the world is automatically expanding. We see more of the West and learn more of the East. Vhalla is just reaching the North when Fire Falling ends, so I’m excited to learn more about it in Earth’s End! Now, the ending. Oh boy. I don’t even know how to react to it. Definitely a major cliffhanger. I’ll definitely have to pick up Earth End’s soon in order to find out what happens next! Overall, Fire Falling is a great sequel to Air Awakens, and I think I liked it even better than the first! I can’t wait to read the rest of books in this series! They really are great! I can’t wait to read the rest of them! Have you read Earth’s End or Water’s Wrath yet? I’m a big fan of Elise Kova and her books! 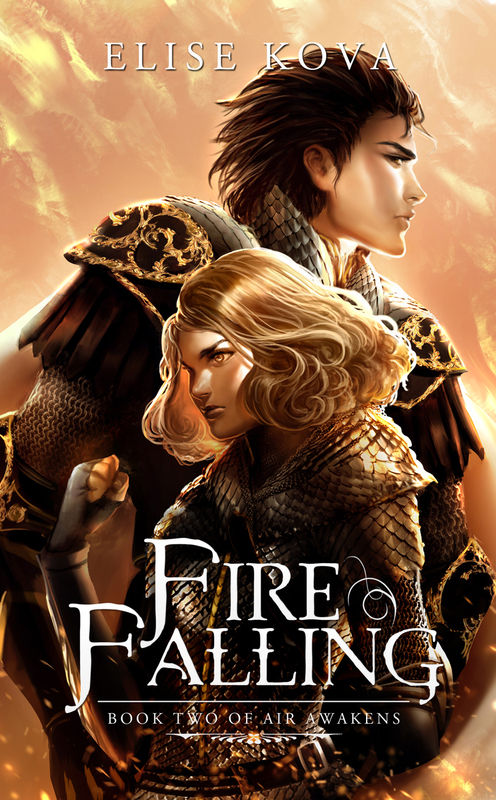 I’m currently reading Fire Falling right now. I’ve only read the first book so far but i loved it so much!Can’t wait to keep going on this awesome journey!